I am suspicious of restaurants bearing names, and have always been. It is possible that the namesake has really put work and thought into a new province of their empire, appointing skilled proteges to be his proconsuls. But even then there’s no guarantee of quality, and especially not given the distance between the European or American home bases of many of the name-bearers in the Sands, and the Singaporean outposts. If the Great Sweary One can mess up in his Midlands endeavours, what can he do from half the world away? On the other hand, if and when the chef is actually here, the calculus changes. 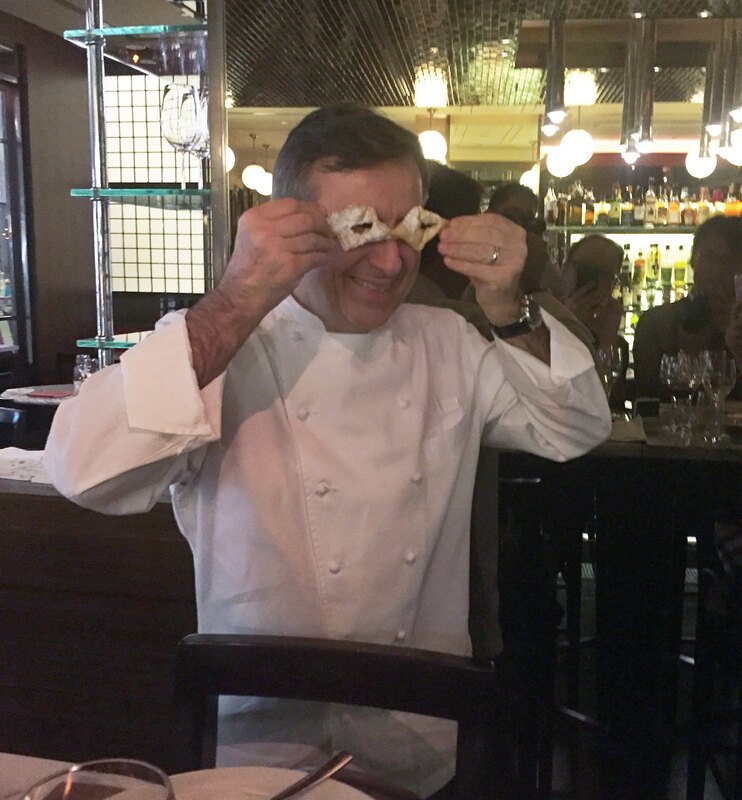 So when Derrick told me that Daniel Boulud is coming out to Singapore, for the fifth anniversary of db Bistro Moderne and the Singapore International Film Festival, and that he was having a little do for the bloggers, I leapt at the opportunity. Right move, as it turns out - for what we get is a lengthy and warm reception from M. Boulud and his team. 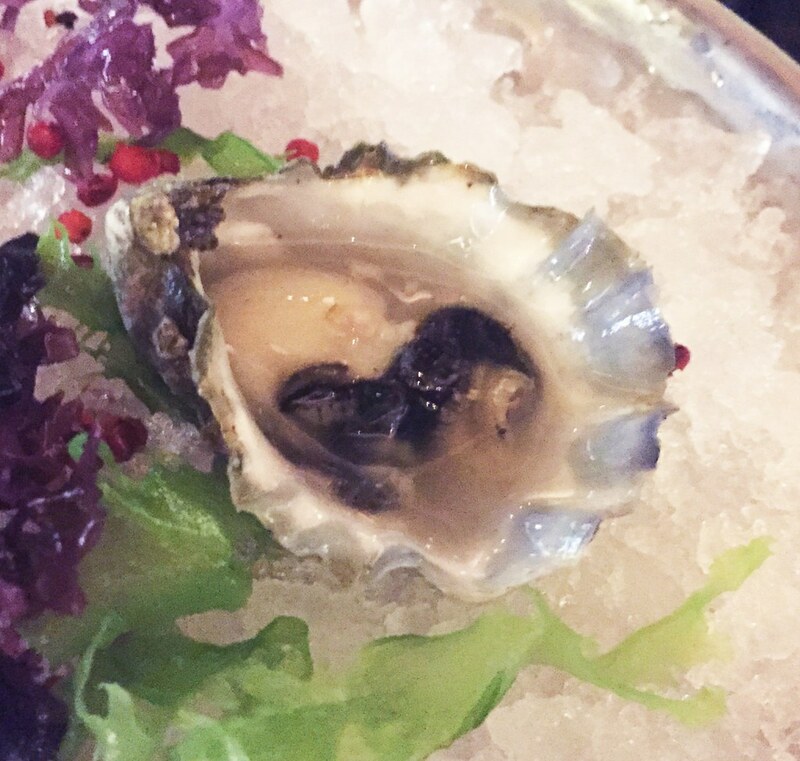 The bistro, all intimate shade and subtle gleam, has been moving towards the sea as of late, a change made obvious on entry with an iced display of oysters sourced from France, the States and Japan among others. And after a very pleasant basket of focaccia and soft pretzels, the first course is an Oyster from Kumamoto dressed with yuzu. It is a demure mollusc, sweet with plenty of brine. The Hamachi Tartare - actually more inspired by the Polynesian poke - is another demonstration of the contrast between high, lilting citrus and marine depth. Diced and succulent hamachi has just a little of the yuzu coating it, reclined on a cooling mattress of avocado cubes and puree; below that, fronds of wakame taste far more intensely of the sea. 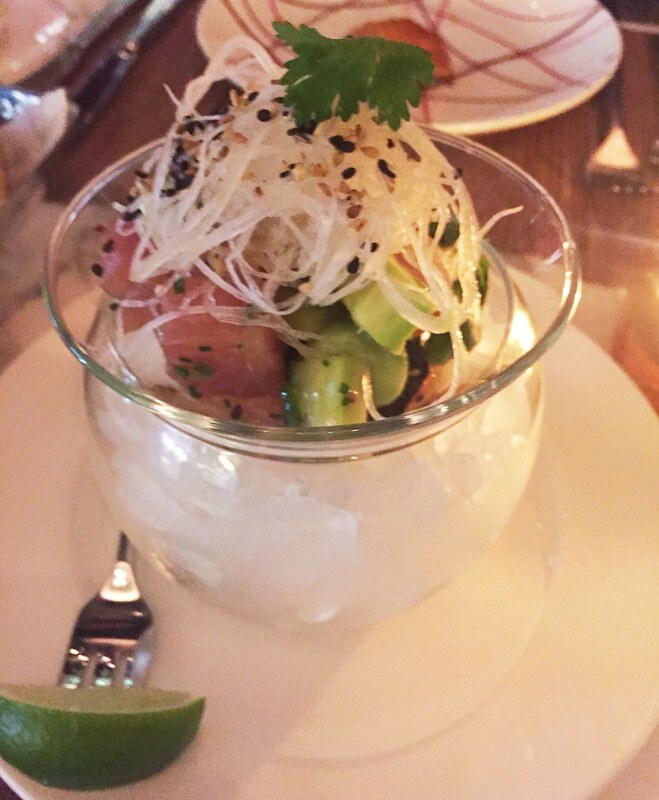 A squeeze of lime helps bring everything to life, nudges of cream and fruit and the tender yellowtail. That it’s wearing a daikon fascinator doesn’t hurt either. 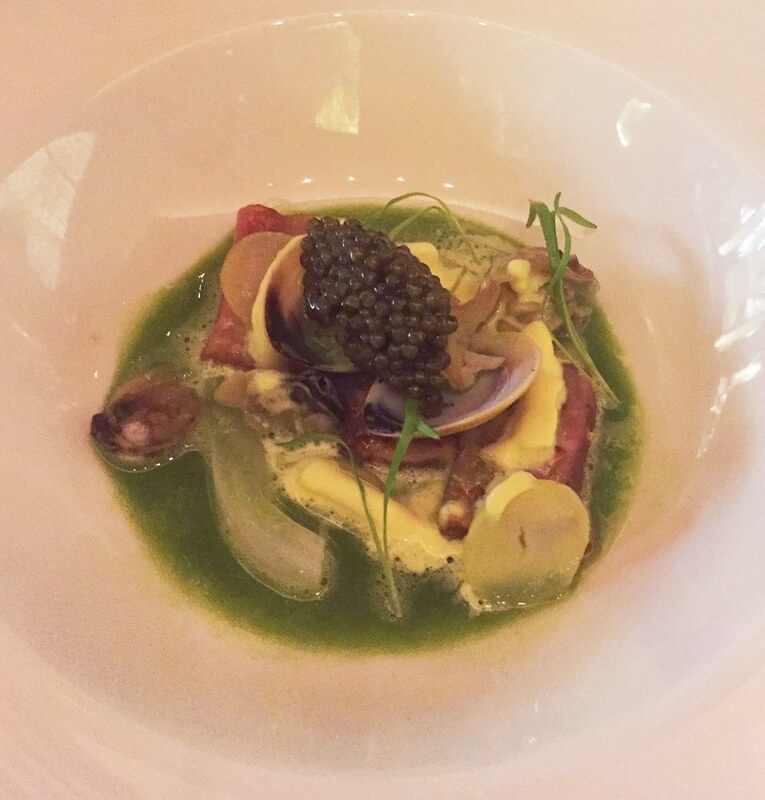 With the first warm dishes come the theatrics, such as with the Mariniere of Clams and Crudo - the jade green broth drizzling on an assembly of tuna, crunchy bursts of salt and flavour that are littleneck clams, and then osetra caviar on top of it all. It looks like a painting, and tastes as vivid with little nudges of anise in the sauce. 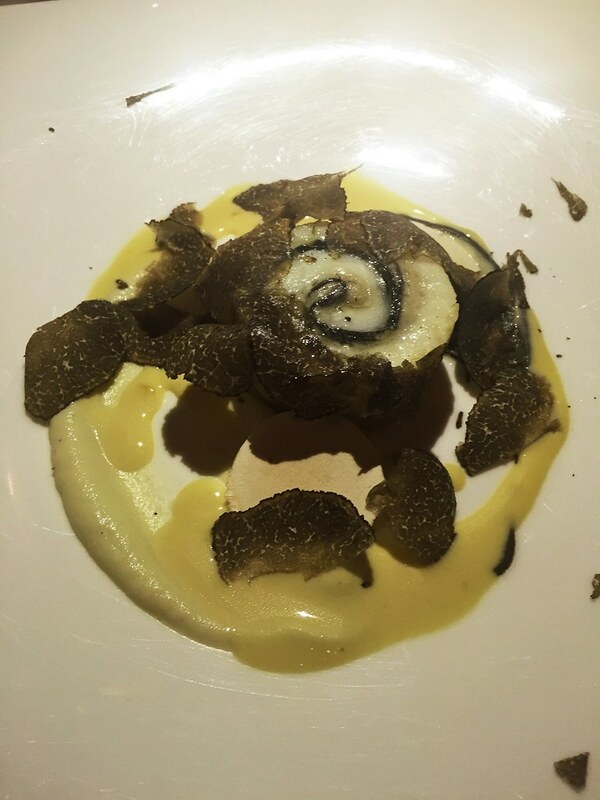 If the mariniere is a colourful painting, the next dish of Dover Sole and Truffles is chiaroscuro in edible form. Fish is tightly rolled around the black stuff, then served with more whites - the sauce, slices of button mushrooms - and flakes of black truffle that Boulud himself comes out to shave on the plates. The contrast of tastes - firm sole standing up to the pungency of truffle - is as bold as the contrast in colour. Just before dessert, Andrew tells us that M. Boulud is preparing another dish for us - perhaps out of fear for our unsated appetites, or concerned that the dinner has been all seafood. Or perhaps he simply intends to show his skill, in which case the extra dish is a rousing success. It is that French classic, Canard a l’orange - but it brings to mind Monet’s paintings of the Houses of Parliament. It is a sketch of the general outlines of both duck and citrus, rendered in different conditions. 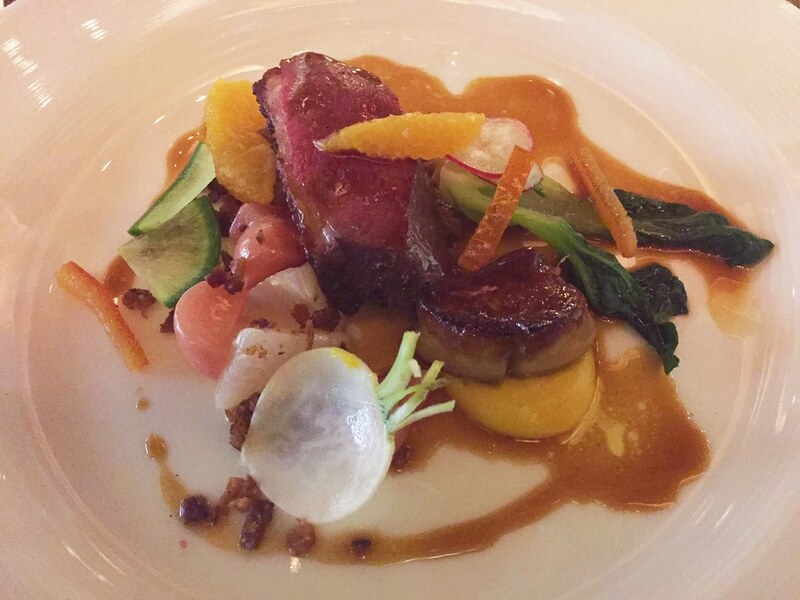 There’s the strip of duck breast, smoke and fissure on the skin and still cherry-red within, murky and forceful. Below that, a dollop of duck confit with a distinct Chinese hue, like classic braised duck with sea cucumber that has been refined and clarified; to one side, a meltingly rich lobe of foie gras. The little Asian twists carry on in the use of tangerines as sweetener, and also the candied orange peel. The Buche de Noel also has its own twisty elements, being a variation on a Mont Blanc. 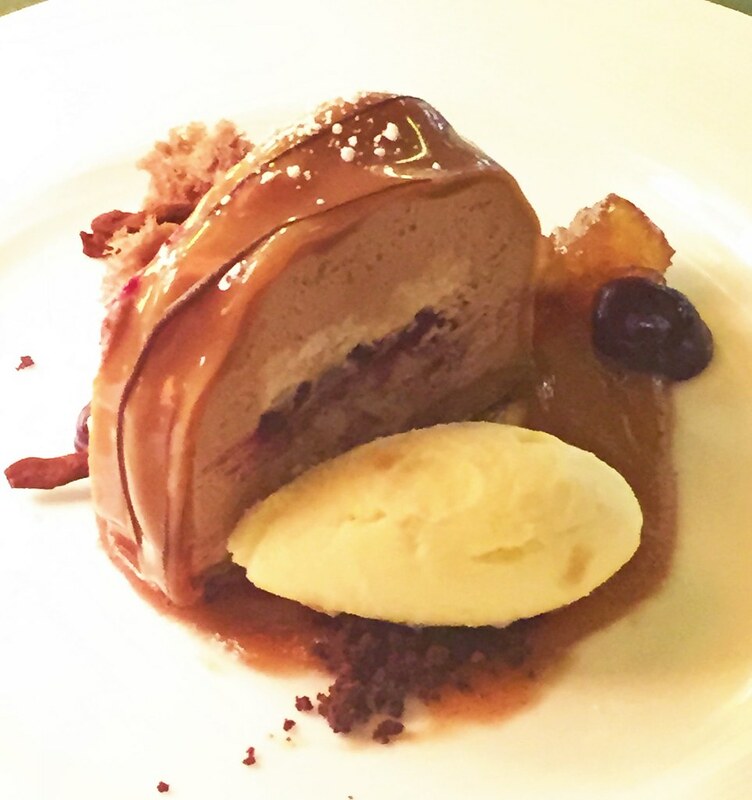 After a relatively light-tasting meal, this is a hand-tipping exercise with the strong flavours - chocolate, cream, starchy and brightly sweet marrons glaces. A dollop of ginger ice cream with stem ginger bits is a well-placed note of warmth and sharpness in a dish that is all round and full. And that’s what it is, right? Forty-plus years of cooking and serving meals, and yet with constant glances and nods to one’s own history. 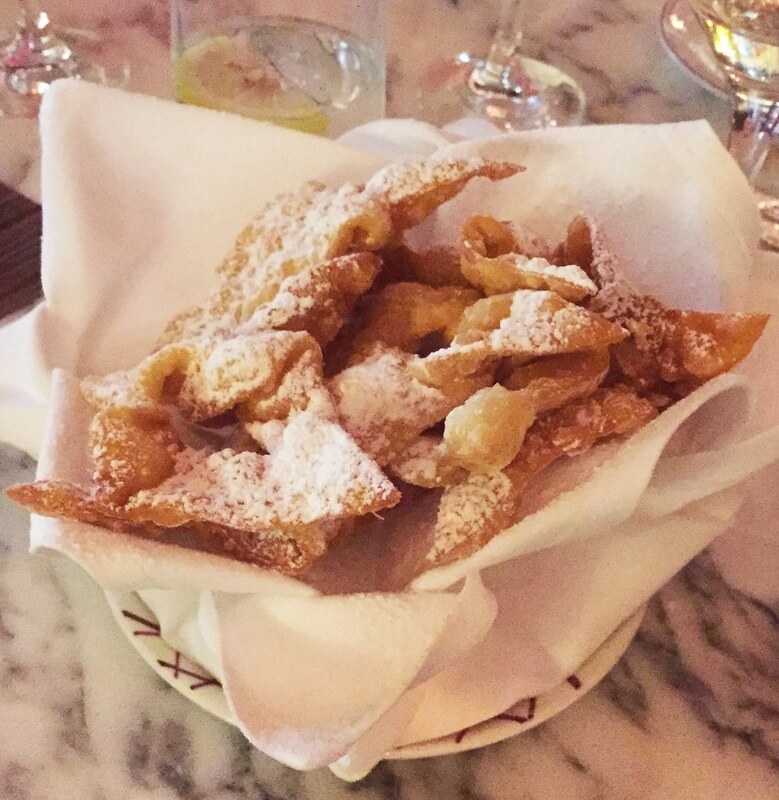 Besides the childhood bugnes, Boulud also speaks proudly of one dish or another as recalling ‘the first days of Daniel’, or ‘something new I liked’. There’s an easy, smiling assurance as to his ability, and then the goods themselves, which are both traditional - we know duck and orange fit, as do fish and avocado - but still manage to bring out new effects. Stumbling out with newly met friends and plenty of wine, some of which are made for Boulud’s restaurants exclusively and all of which are carefully paired, I feel more grateful than I’ve been about a meal in a long while.